Peshawar: Pakistan is currently training more than fifteen thousand beauticians that will not be able to find jobs when they graduate. In fact, more than half of the graduates of the whole TVET (Technical Education and Vocational Training) program cannot find jobs after graduation. And it is not because there are no jobs to be had … just not the ones Pakistanis are being trained for. Shortly after the inception of the 18th amendment in July 2011, the Ministry of Professional and Technical Training was established. At the national level National Vocational & Technical Training Commission (NAVTTC) Pakistan is the apex body that regulates, facilitates and provides policy direction in TVET. Initially, the charge given to the ministry was to fix Pakistan’s skills and unemployment problem, contributing to the sluggish economic growth. To enhance the training culture in Pakistan, during the ongoing reform in TVET sector, the first ever skills for growth and development policy was launched under consultation of GIZ Pakistan for Vision 2025. For years 2015-16, official statistics show that of the 300 thousand graduated trainees of TVET about half are currently unemployed. It seems the TVET reforms are on the wrong track by producing graduates with the wrong skills-set for the job market. Under special TVET reforms programmes, the government has received around € 63 million after consultation with GIZ for years 2011-2016 from different international donors. Around PKRs. 4 billion were spend by different provinces and NAVTTC which means that total expenditure in this particular program is around 12 billion rupees. About 6 billion are wasted in training people who won’t be able to find jobs. It is clearly showing the lack of understanding between labour supply and demand in designing training programs. According to the current budget of TVET reform during 2011-16, the reform program spent on average around 40k rupees per trainee on one particular training course. After the newly elected government took office in 2013, it announced a different strategy for generating jobs through business loan and youth development programmes to address the huge swell of unemployed youth in the labor market. Three out of ten people in Pakistan consist of youth between 15-29 years old. According to the UNDP report one in three young people in Pakistan is uneducated with no vocational skills to help him or her get a job. The national TVET policy of skill for growth and development subsequently require skilled youth against a right opportunity to reduce conflict and establish a foundation for economic growth. The official data shows that current status of graduated trainees is surprising: around six out of ten are unemployed, two are self-employed and the rest are on jobs in sectors like private, abroad, government, internships and higher studies. According to Bureau of Statistics Pakistan survey for year 2014-15 the overall labour force in Pakistan is 60 million out of total 200 million (approximate) population excluding FATA and military restricted areas. 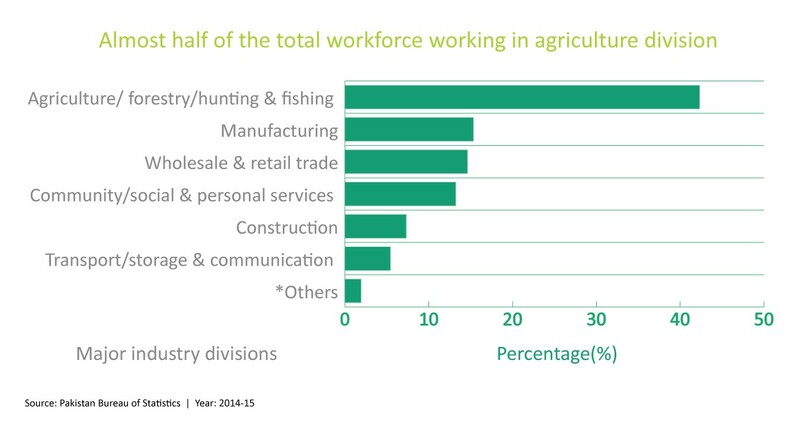 Of these, 4 out of 10 labour works in agriculture and the remaining 6 work in different divisions like constructions, manufacturing, wholesale, transport and personal services etc. The two types of programs they have in TVET are Technical and Vocational. While both types of training courses are less academic and more practical, vocational training often focuses on manufacturing and construction while technical training is more computer-oriented. Vocational trainings are geared to equipping youth with basic manual skills to get them jobs quickly. Technical trainings are oriented to preparing for a future job market in the digital age. According to National Skills Information System (NSIS) statistics in Pakistan, the total numbers of TVET institutes are 3581 of which around 2500 is private and around 1000 are public institutes. 2600 is vocational and around 900 are technical. Further data shows that in every ten graduates, eight pass out from vocational institutes and two from technical. “Although we are bound to offer the desired courses as prescribed by the authorities and follow them, but yes currently they are changing the offered courses introducing demand driven trainings,” said a local institute owner mentioned during discussion with Truth Tracker, but did not want to give his name when publically criticizing the program. A look at Pakistan’s job market last year reveals the mismatch between specialized training and available jobs. Last year, half a million local and international opportunities were advertised for the 300 thousand newly trained jobs seekers in the country. This means that for every five available jobs on the market, there were three newly trained graduates but most often their skills didn’t qualify them for the advertised jobs. In many cases, too many technical trainees graduated into a job market dominated by vocational jobs. For instance, in year 2015, there were 82,000 advertisements for ‘LTV Driver’ while only 6,000 were trained. That means there was only one person trained for every 14 open position. Even more scarce, for each graduating ‘Steel Fabricator’ there are more than 1,400 job vacancies advertised annually. On the other extreme, there were only 2,000 job advertisements for the 36,000 students who specialized in computer skills. That means there were 18 graduates competing for every single vacancy. 2,000 IT persons also had to compete to secure a single job because of the surplus production by TVET Institutes. Comparing the number of students graduating in each sector with the number of jobs advertised annually for each sector shows a lack of planning for the labour market needs. As further data reveal that in province Punjab, the most popular vocational program is ‘Beauticians’ even though there are very few jobs in the market for this profession. The most popular trade in Technical fields in the same province is ‘Electrical Engineering,’ which across the country does not have enough demand in the job market to absorb the graduates. The government along with GIZ says it is adjusting the program to boost employment. The program is trying to strengthen relationships with private corporations to train students for specific vacancies. However, they say it will take at least a year to align course offerings with market demand. Sonia Emaan, Technical Advisor Communication GIZ, told Truth Tracker that with latest strategies of demand driven courses and private sector connection will remove the issue of unemployment in Pakistan near in the future. Since many graduates were unable to find jobs, many simply re-enrolled in another vocational program to continue to collect a student stipend. The government and donor programs did not have a tracking mechanism in place to control for this, especially as students hopped from program to program. Many programs are designed to grow Pakistan’s economy by bringing more women into the workforce, but recruitment programs often fail at that. The number of spots reserved for females is large but many places go unfilled. Due to social norms, female enrollment numbers lag behind. The government has failed to identity job areas and conduct outreach campaigns in vocational and technical areas where female participation can be nurtured and come to be viewed as an acceptable profession for women. Emaan of GIZ said they are focusing on collaborating with the textile industries to outsource embroidery and sewing to female graduates of the program. This work could be done at home, which may be more acceptable to families reluctant to allow female family members work outside the home. Youth-focused programs funded by the International Labor Organization are also exploring female entrepreneurship and micro-financing schemes to open up a new professional space for women graduates. Pakistan’s growing and diversifying economy and ballooning population add urgency for a course correction. Globally, the economy is soon to face a shortage of more than 50 million skilled workers while Pakistan is projected to continue to struggle with a workforce unprepared for the marketplace. In year 2015-16 the Prime Minister’s Youth Skills Development Programme targeted 25,000 trainees across the country to provide more working opportunities with total cost PKRS.1178 million and trained about three quarters of the promised number. The government spends an average of PKRS 30k per trainee for one full course. Yet it does not collect data to track how many graduates of each program manage to find jobs within their training area after graduation. The United Nation Development Programme initiated a youth development program for the youth of Karachi in Sindh in year 2015-17 with an annual budget $3 million US dollar and targeted 13,000 young men and women. After completion of first phase, around 6,000 young men and women have graduated and around 3,700 graduates have secured employment. Punjab has the most demanded for skilled workers due to its booming industry. They are on track to absorb more specialized workers to help industry and provide space for youth to get jobs. Without better data collection and data-driven design, it is unlikely that major reforms will take place to fill job market demand. The economic future of the next generation of young Pakistanis remains in doubt. The vision 2025 of skilling youth to reduce unemployment in Pakistan includes a medium-term goal of graduating one million people each year by 2020. Although to make the actual reforms in TVET sector, training needs to be aligned with local and international industry and gender equality initiatives to produce workers that can find jobs in Pakistan’s growing economy.